Ultrasound is a medical imaging technique that allows us to visualise the internal architecture of many soft tissue organs. Disease or injury to soft tissue structures causes in a change in the appearance of the tissue so the use of ultrasonography allows us to diagnose, document and quantify the extent of the damage. What structures can be visualised with ultrasound? 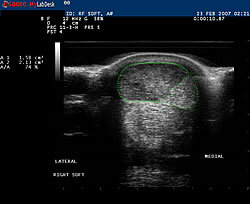 Although ultrasound has mostly been used in the veterinary field to diagnose and monitor musculoskeletal injuries such as “bowed tendons” or “strained ligaments” the advent of new technology and improved techniques allows us to image just about any soft tissue structure in the equine patient. Ultrasound is an excellent compliment to radiography (x-rays) because it allows us to examine the soft tissue structures associated with joints that cannot be visualised on x-rays. Structures such as the joint capsule/synovium, joint fluid, cartilage, ligaments, and subchondral bone in many joints such as the fetlock, knee and stifle can be assessed. 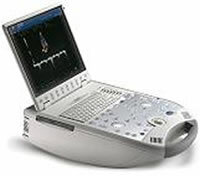 In some instances, ultrasound also can be used to view bone surfaces for the presence of fractures and infected bone. For example, pelvic fractures are commonly detected by ultrasonographic examination. In addition, ultrasound can also be used to evaluate the presence of foreign bodies with penetrating wounds, chronic non-healing draining tracts or to determine the nature of a swelling or mass such as an abscess, haematoma or a tumour. The thoracic (chest) and abdominal cavities are areas also commonly scanned to detect disease. In cases of pneumonia ultrasound can detect fluid on the lungs, abscesses or consolidation of lung tissue. Abdominal organs such as the intestine, kidney, liver and spleen can be examined in cases of colic (abdominal pain), chronic weight loss or evidence of organ disease. Ultrasound guided injections of tendon and ligament injuries are commonly performed at this practice. Tendon and ligament treatments such as ACell, stem cell therapy and platelet rich plasma (PRP) are delivered via ultrasound guided injections. This technique allows us to accurately deliver the drug directly into the lesion (damaged area). Ultrasound is performed initially to diagnose injury or disease however it is also used extensively during follow up examinations to monitor and assess the degree of healing, particularly in tendon injuries. Ultrasound is a non-invasive, non-painful procedure that can be performed on a standing patient under light sedation. To obtain the best image, the area to be scanned should be clipped and thoroughly cleaned. A coupling gel is also applied to the area to ensure ‘good contact’ between the patient and the probe. A thorough examination typically takes around 30-40 minutes. Our practice is equipped with a state of the art portable digital ultrasound machine, the MyLab 30 Vet, which is considered the best portable ultrasound equipment currently available. This technology produces very high quality still and moving (video) images which can all be recorded and copied to CD/DVD or USB. Recording the findings of each ultrasound exam provides invaluable information when assessing the progress of a particular injury.